Regional diplomacy could be more than just a buzzword --if the United States would do the right thing. Iran, Russia, India, and Tajikistan all played a key role in helping U.S. forces dislodge the Taliban in 2001. More importantly, all of them, together with China and Uzbekistan, fear that a resurrected Taliban regime would foment Islamist insurgencies within their own borders. Russia faces nascent Islamist forces in its Muslim south. India worries that Taliban control in Kabul would lead to an upsurge in Pakistan-based terrorism. The Shiite theocracy in Iran fears that a Taliban regime would help the Sunni Jundullah separatist movement in Iranian Baluchistan and Salafi extremists in other regions. Tajikistan faces Sunni extremist groups led by Hizb ut-Tahrir and is increasingly unsettled by an influx of Afghan refugees, which could grow if the Taliban were to return to power. China is beset by Islamist Uighur separatists in Xinjiang. But these proposals implicitly assume that the United States would remain in the driver's seat in Afghanistan. Meanwhile, the regional neighbors have no desire to legitimate an enduring U.S. presence in the country -- particularly with regards to the U.S. air bases now being used for intelligence surveillance missions in areas of Afghanistan bordering Russia, China, and Iran. Huge base expansion programs under way indicate that the U.S. Air Force plans to stay in Afghanistan even if the Army and the Marines pull out, and a readiness to phase out these programs would be necessary to set the stage for a viable regional exit strategy. This would require a firm stand by Barack Obama's administration in the face of Pentagon opposition, but it is the key to mobilizing the regional backing necessary for the containment of the Taliban. The first step would be a U.N. diplomatic initiative designed to get the regional neighbors to join in a multilateral agreement providing for the military neutralization of Afghanistan and for sustained regional support as the country stabilizes. The agreement would set a timetable providing not only for the complete withdrawal of all U.S. and NATO combat forces within three years, but also for the termination of U.S. military access to bases in Afghanistan, including air bases, within five years. In conjunction with the disengagement process, the agreement would set in motion U.N.-brokered peace negotiations. The Taliban has long demanded a disengagement timetable as the precondition for peace. Ironically, however, its emotional appeal comes primarily from its role as the standard-bearer of opposition to foreign forces. Thus, when and if the United States does present a timetable, it will be cut down to size. The Taliban will be in a strong bargaining position, but only as the dominant force in the ethnically Pashtun south and east of the country. The focus of peace negotiations could then be redirected from the terms for power sharing with the Taliban in Kabul to the nature and degree of the power to be ceded to the Taliban in its Pashtun strongholds. This approach is likely to get Pakistani blessing as the best deal available under present circumstances. Islamabad's leading strategist on Afghanistan, former Foreign Secretary Riaz Mohammed Khan, suggested such a shift in focus in a Washington meeting on June 17, observing that the Taliban has "important regional influences where they should be accommodated." He specified Khost and Paktia as examples of provinces where Taliban control might have to be accepted, and he implied that Afghan President Hamid Karzai and Pakistan's Army chief, Gen. Ashfaq Parvez Kayani, had explored such arrangements in their two Kabul meetings in early June. If it is the price for keeping his hold on the presidency, Karzai might be prepared to accept Taliban control over some local strongholds. This would be facilitated by constitutional reforms strengthening provincial autonomy. The Taliban is likely to condition a settlement on a formal devolution of power that would give the provinces partial or complete control over the police, the courts, local elections, taxation, and opium production. This would not be a de facto partition, as some have suggested, but rather a shift to a loose federation, similar to the model that prevailed under the pre-1970 monarchy. The provinces under Taliban rule would have a significant stake in stable relations with Kabul as a source of foreign aid for dams, roads, and other economic infrastructure projects. From the perspective of the United States and its allies, an acceptable U.N.-brokered neutralization agreement would have to bar the use of the Taliban provinces for transnational terrorist activities, place limits on the size and character of the local militias maintained by the Taliban, and rule out the development of local air forces. So long as Kabul has a monopoly on air power, the use of the Taliban provinces as bases for terrorism could be combated and a devolution of power need not mean the breakup of the Afghan state. Afghanistan's neighbors would be more likely to help contain the Taliban under a U.N.-brokered agreement than under wartime conditions in which they want to avoid identification with an unpopular U.S. military presence. The close intelligence cooperation between the United States, Iran, Russia, and India that existed in 2001 could be revived and broadened to keep the Taliban from pursuing power in Kabul again. Equally important, the agreement could lead to coordinated aid efforts and could encourage the neighbors to increase their economic assistance. These partners are more likely to provide large-scale aid if helping out strengthens their own influence in Kabul rather than merely reinforces a U.S.-dominated regime. Iran and India, which are already giving large-scale economic aid to Kabul, might well increase their assistance packages if U.S.-NATO aid diminishes. Li Qinggong, deputy secretary-general of the China Council for National Security Policy Studies, alluded to increased Chinese aid in a Sept. 29, 2009, statement, which also envisioned talks on "how to dispose of the forces of al-Qaeda" if and when the United States disengages. Beijing is investing $3 billion in Afghanistan's Aynak copper mine and is considering a U.S. request for help in police training. Russia has already opened negotiations with Kabul on a $1 billion package of projects to refurbish 140 Soviet-era hydroelectric stations, bridges, wells, and irrigation systems. The proposed agreement would be signed by the seven neighbors, the United States, and NATO but could also include others, notably Saudi Arabia, that are playing a significant role in Afghanistan. Signatories would pledge to respect the country’s military neutrality, not to provide arms to warring factions and to co-operate in U.N. enforcement of an arms aid ban. No U.N. monitoring system could completely seal off arms aid to the rival Afghan factions or bring an end to the competition between India and Pakistan for influence in Kabul. But a structure for regional cooperation could moderate arms inputs and reduce conflict among rival factions. The most difficult issue in negotiating such an agreement would be how to deal with the status of the Durand Line, the de facto eastern boundary of Afghanistan imposed by Britain in 1893. The Durand Line has never been accepted by Afghanistan, and Pakistan would undoubtedly press for its confirmation as a key condition for its participation in a regional neutralization accord. However, this would be unacceptable to key Afghan political factions, including the Taliban, and a compromise finessing the issue would be necessary. To be sure, Islamabad would not like an agreement that leaves the boundary issue in abeyance and legitimizes the role of India as a power broker in Afghanistan. But Islamabad would have two powerful reasons for joining in the accord. First, India, like other signatories, would be barred from operating out of Afghanistan militarily in the event of an India-Pakistan conflict and from using Afghanistan as a base for supporting Baluch and other ethnic insurgents in Pakistan. Second, while the accord would seek to prevent the Taliban from re-establishing control in Kabul and using its local strongholds as a base for terrorist operations elsewhere, it would not seek to remove all Taliban influence in Afghanistan. 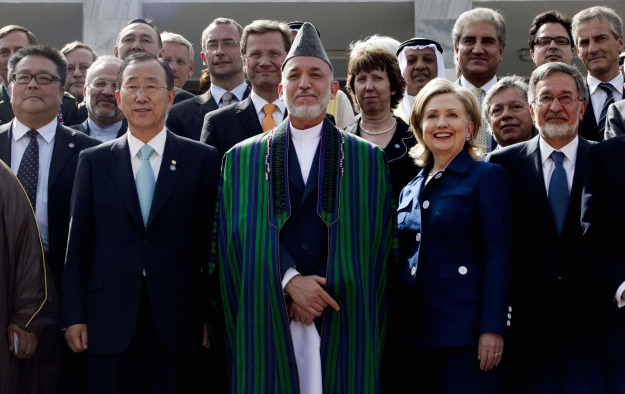 Thus, Pakistan would still have political allies in future Afghan power struggles. Pressure from China, which provides Islamabad with fighter aircraft, would also help assure Pakistani participation in a regional accord. The biggest obstacle to the accord is not likely to come from Pakistan, but from a Pentagon mindset in which the projection of U.S. power is viewed as a desirable end in of itself. Some of the 74 U.S. bases in Afghanistan, including airfields, are designed solely for counterinsurgency operations and might be expendable in a neutralization accord. But the mammoth airfields at Bagram and Kandahar are projected to grow in the years ahead -- ambitious new construction projects continue at both bases, despite Obama's pledge to begin withdrawing troops from the country in the summer of 2011. Furthermore, Congress is considering funding requests, totaling $300 million, to establish new bases at Camp Dwyer and Shindand, close to the Iranian border, and Mazar-e-Sharif, near Central Asia and Russia. Aware of Afghan opposition to "permanent bases," Pentagon and White House officials now speak of "permanent access," which would guarantee the use of these bases for intelligence surveillance operations. The underlying issue that the President has yet to address is the future of the air bases, and the larger question of whether the Pentagon will still be using Afghanistan to further its global power projection goals long after the Taliban and Al Qaeda are a distant memory. Until he faces up to this issue, no diplomatic cover for U.S. disengagement will be possible. Selig S. Harrison is the co-author of Out of Afghanistan and author of In Afghanistan's Shadow. He is director of the Asia Program at the Center for International Policy. FOREIGN POLICY is published by the Slate Group, a division of Washingtonpost.Newsweek Interactive, LLC All contents ©2009 Washingtonpost.Newsweek Interactive, LLC. All rights reserved.